I can confirm v0.5 of the Gmail/Google Apps Email extension is working on Magento 1.3.2.4, I use that currently combination for one of the stores I run. You could try loging in and out of Magento? Also, please paste the URL that is giving you a 404 error? I have logged out and back in of the admin and I still get the 404. That url looks like it’s missing a key, do your other admin urls have a key? Nope, no keys on any admin URLs. Your extension appears to work (thanks by the way). It’s just the self test that’s not working. I face this error when running self-test. Connection to Google SMTP server successful. Please check and double check your email and password. If in any doubt you can login to the web interface for your email address to confirm at either ‘mail.google.com/a/your_domain’ or ‘gmail.com’. Testing failed, please review the reported problems and if you need further help visit ASchroder.com to contact me. I installed the module and had a successful test. However, none of the emails sent within Magento are being sent through Gmail. I am running Magento version 1.3.2.4. Thanks for the offer to try the beta, but I think I’ll wait. Have you got any other Magento Email extensions installed by any chance? Please try the extension on a fresh install of Magento on the same server/environment – if it still fails let me know and I can help try to diagnose. nothing ventured, nothing gained 🙂 Keep an eye out for the proper release shortly! Best thing to test for is connectivity direct to the gmail smtp servers at smtp.gmail.com – after all that is what the extension needs to connect to. Let me know how you get on. Since they weren’t copied over correctly, from the admin menu you didn’t seen any additional configurations but once they were copied correctly everything showed up as expected. thank you thank you! works great. our contact form wasn’t able to send emails to our google apps domain… they just never came through. once i added your extension, our emails were coming through (I think google apps were blocking inbound messages to our domain that had our domain in the “from:” field but were did not use authenticated smtp). Thanks! Hi, Jeff. That looks more like an issue with the Magento install than with the extension itself, have you tried installing any other extensions and got different results? Hey thanks for replying, because of your suggestion that is might be something with the Magento install I took a closer look. Lo and behold I found the pear.ini file was configured improperly due to the fact the Magento install was a copy from another developer… this could have caused headaches in the future. Once pear was re-configured everything was golden. You need to test connectivity to smtp.gmail.com (not imap) – though if you can get to one, you should be able to get to the other. Also you must test it on the actual server that the extension is running from. If both of those things have been done, and still no emails get sent, then perhaps some security setting in Apache/PHP on your host disallows PHP making outbound connections directly? The emails may still send regardless? Also, do try logging in to gmail/google apps from the web interface google provides, it might be requiring you to enter a captcha (though that error would not cause the connection problems). I have a very ambitious feature request. Wouldn’t it be great if we could somehow using google’s api view google docs, google calender and our google apps mail all from the comfort of our magento admin panel? That is very ambitious! Plus Google already offers such great web based tools for those services, maybe a better integration would be a mini Magento Dashboard widget for your Google home page – so you can see order status/sales from within your Gogle apps domain? Hi — I installed this this weekend, and we did get some errors. Customers were getting an “there was an error processing your order” error. When we dug into the code, it appeared orders were going through, but the extension was throwing an error so customers were not getting a “success” message. We changed the “Send Order Email Copy Method” from “separate email” to “BCC” and orders began going through again. Ive got a weird one, I hope you can help. 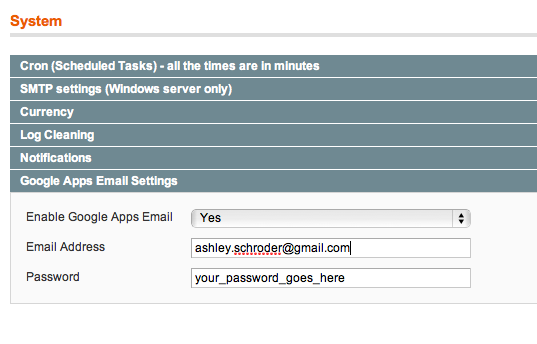 Im using your gmail simple smtp extension (0.5) and the Aheadworks extension product questions. When people send a email it goes into the magento system admin, and I can answer it from the admin. Once I get the question answered and hit send it goes back to the customers email address that they posted. But when they reply back to me it goes to ‘general’ or ‘general@yahoo.com’. I have the setting set to: Use Store Email Addresses for Reply-to [yes]. Please any help would be greatly appreciated. Sounds like a setting in the product questions extension that must be sending as the ‘general’ contact, either disable the reply-to setting, in which case emails will return to the address that sent them, or check the code of the extension to see if you can make it use a different contact? I removed that and it appears to be working. If it acts up again I will let you know. I posted it here thinking someone else might find this useful as well. Thanks Bryan, I appreciate you reporting back on the solution. i run self test and email is delivered fine. i set Enable Google Apps Email to YES and emails are still sent from my server postfix not from google apps. I run this test on my fresh development Magento ver. 1.3.2.4. with cache disabled. Any idea what i might be doing wrong? Not really – but try enabling logging in magento and then run the self test, send a contact form, sign up for the newsletter and create a new order and see what is logged – my extension is written so that it will log out debug if logging is enabled. Let me know what it outputs. Brilliant, thanks for the update. Glad to hear it’s all sorted now. It means you don’t have openssl installs. On windows you just enable the openssl.dll in the php.ini configuration file. You may even be able to control it through the XAMP interface? I`ve OpenSSL and enabled open ssl in the php.ini file and restarted the server. I’ll have to give them a buzz. Any recommendations on what I should tell them? Is it as simple as enabling with php.ini? I have to be honest, I haven’t used a windows computer for about 8 years – I’m definitely not the best person to be talking to about this, but I can say the error you get with my extension is related to not having openssl. if you have a web host, ask them to enable open ssl for php – they should be able to fix it, if not get a better magento host. Ssl is installed and enabled in php.ini, see picture in my previous post. I can confirm I have v0.5 running on 1.3.2.4. I would suggest making a note, somewhere in the documentation or above the self test link, that you need to save the user/pass first before running the test. It took me forever being an idiot before I realized what I was doing wrong. Running your extension on my test/development server and it works a treat except for the Contact Us form. I get a ‘contact us unable to submit request’ error. This seems to be a known problem in Magento but with no clear fix apart from hacking out the standard smtp code. Any thoughts? Hi, are you sure there are no other conflicting extensions? Not sure if your two previous comments were aimed at me. I don’t have any other extensions. Hi, Jem – sorry crossed lines – the next release makes it clear you need to save the connection details before running the smtp/gmail self test. In terms of the Magento contact form not working – I’d suggest you enable logging and then run through it and send me the logging to see if my extension is even being called and what point it is getting up to in the send process. I set the google App email in SMTP Pro and Google Apps Emails setting extension. 1. SMTP Pro extension is not working. 2. Regarding to Google Apps Emails setting, the auto responder is not working and sender is set to hosting email address, not Google App email. Would you let me know how auto responder works? My website is not sending out any e-mail. Please check and double check your username and password. FYI: The problem is not due to Ashley’s extension. It existed even before I installed Ashley’s extension. Thanks for the time reading this post.